There is something immensely satisfying about a tarte tatin. Well, if it’s actually successful. It might be due to the fact that as the story goes, it was an unintentional discovery, born from a mistake by the Tatin sisters in Lamotte-Beurvron, France. The knowledge that brilliant things can spawn from seemingly disastrous culinary errors helps keep morale up when things don’t quite turn out as planned. You never know – that mishap from the other night could become next tarte tatin! Or perhaps the satisfaction’s due more so to the process of constructing the tart upside down and the suspense of turning it out. Will it work or will it fall apart in a sticky mess? You stick your tongue out in concentration, brace your legs, count to ten and send a quick prayer to the cooking god. Preparation – and a little sucking up to higher powers – is key. Oh, you don’t do that? I swear it helps. In any case, the rush of excitement I get when a tarte tatin turns out effortlessly is probably a little bigger than I’d like to admit. I almost don’t care about how it tastes. The fact that it came out of the pan in one piece, and looks oh-so-pretty is rewarding enough. But note the almost. Because if you’ve gone to all that effort you may as well ensure that it tastes damn good too. Tarte tatins are traditionally a sweet dessert, made with apples, however this version with sweet potato, caramelised onion and goats cheese bridges the gap between sweet and savoury very nicely. I have a penchant for all three ingredients (surprising coming from the girl who despised onions a decade ago), and pastry is always a good thing, so there isn’t much room for error in the taste department. Nevertheless, it is important to go for a strong goats cheese in order to create a more defined flavour contrast. Try feta if you can’t find goats cheese or don’t want to fork out the extra dosh for it (I don’t know about elsewhere but it’s darn expensive in Aus). If you’ve got the constitution to prepare one under pressure, this is serious dinner party material. 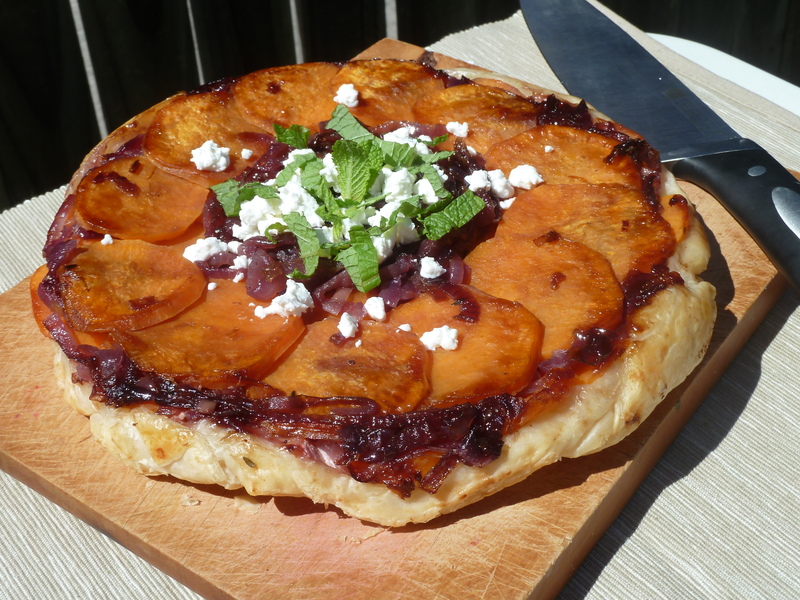 Light crispy pastry, sweet sticky onions, glorious orange sweet potato, piquant cheese and fresh mint. Enticing, indeed. 1 25cmx25cm (about 150g) sheet puff pastry, thawed if frozen. 150g soft goats cheese (I used chevre) or feta, crumbled. Preheat the oven to 200C. Bring a pot of water (preferably with a steamer basket inside) to the boil. Add the sweet potato & cook for about 7 minutes or until just tender. It doesn’t matter if there are a few slightly crisp bits. Transfer to a strainer to drain, but don’t refresh with cold water – you want to let it carry on cooking a bit. Meanwhile, heat the olive oil in a 22cm oven-proof frying pan and add the sliced onions. Saute over a medium heat for approximately 10 minutes or until well softened. Stir through the sugar and thyme leaves. Tip in the vinegar and cook, stirring regularly, for about 7 minutes or until sticky & caramelised. If the onions begin to dry out, add a little boiling water. Season well with salt and pepper. Remove ¾ of the onions from the frying pan. Use a plastic spatula to scrape the rest into a small flat circle in the centre of the pan. Grease the sides of the pan (be careful, not to burn your fingers!). Arrange one layer of sweet potato slices in a circle around the outer edge of the frying pan, so that they are just overlapping. Now arrange a second circle within that and continue until you can no longer see the bottom of the pan/the onion in the centre. Distribute the reserved onions over the sweet potato and arrange any remaining sweet potato slices in rings, starting from the outer edge and working inwards again. Sprinkle 2/3 of the goats cheese on top and then cover with the sheet of pastry, tucking the edges underneath. It might crinkle up in places – that’s fine, it will give it a rustic look! Bake for 35 minutes or until the pastry is puffed up, crisp and golden brown. Rest the frying pan on a wire rack for ten minutes, then run a flexible plastic spatula around the edges of the tart. Place a board or plate over the top of the pan and flip over, making sure you have a firm hold of both the plate and the pan! The tart should come out quite easily. If the onion sticks to the pan, simply scrape off and rearrange in the centre. Sprinkle over the remaining 1/3 of goats cheese and garnish with torn mint leaves. Best served immediately with a green salad, though tastes quite nice cold for lunch the following day!